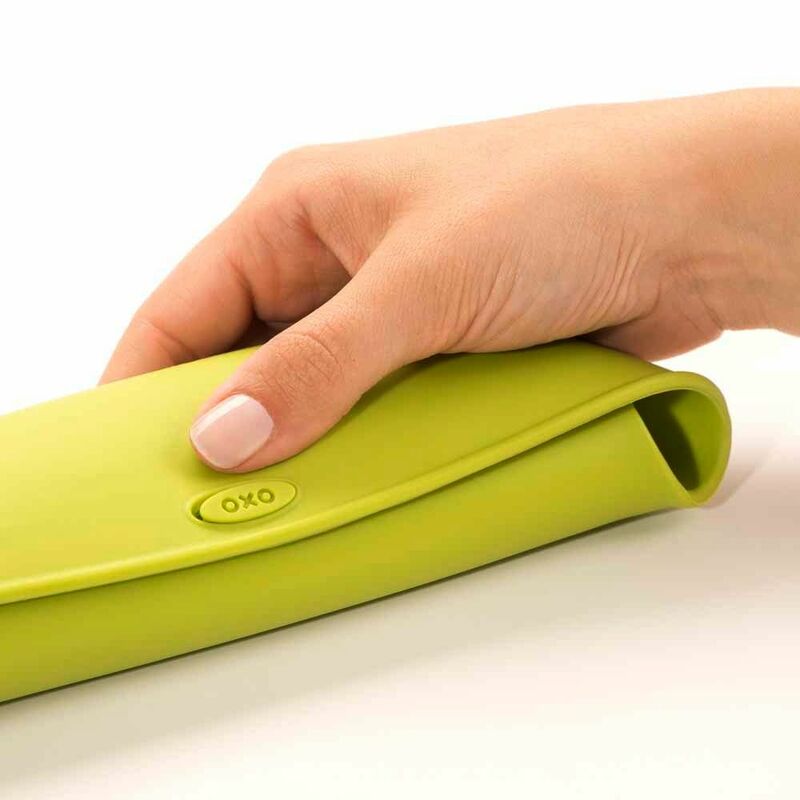 Whether feeding baby at home or on the go, keep it clean with the OXO Tot Roll Up Bib and Spoon Set. 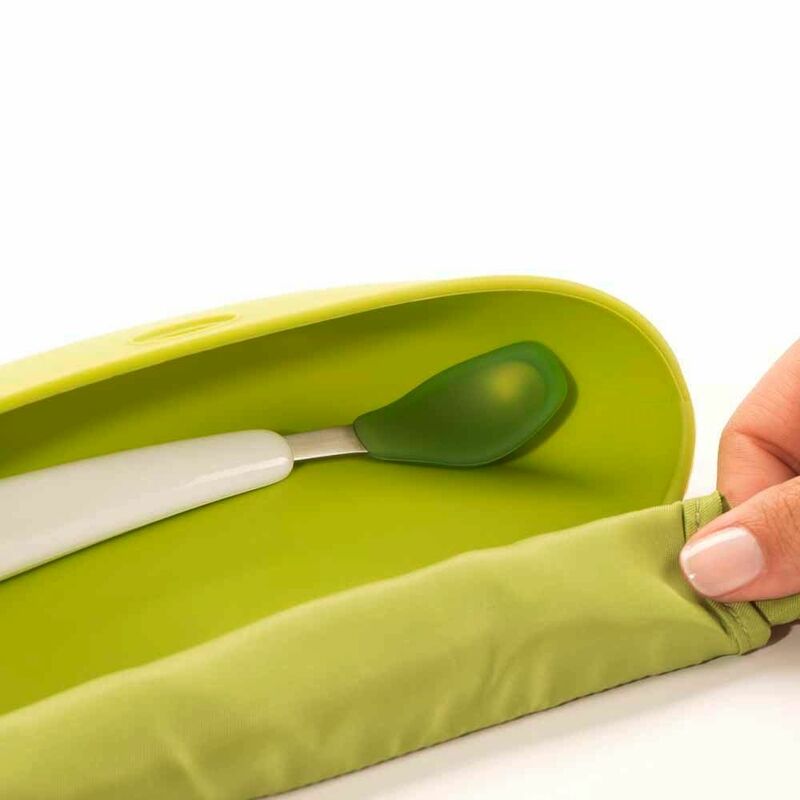 The bib's soft, food-safe pocket is wide enough to catch virtually any stray pieces of food that miss baby's mouth. The fabric portion of the bib provides ample coverage to protect baby's clothes, and is shaped for comfort during mealtime. When you're out and about, simply roll the bib's fabric into the silicone pocket, secure closed and tuck into a diaper bag. 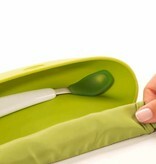 The silicone pocket keeps the messy bib away from the contents of the diaper bag. Easy-to-use Velcro closure is secure enough to resist tot's tugging (really.) And is adjustable as your little one grows. The bib's length and soft pocket won't interfere with the high chair tray or table. Both the fabric and silicone materials are easy to wipe clean. Feeding spoon has a protective food-grade silicone coating which is gentle on baby's gums and mouth. The soft edges of the silicone can be used to scrape the last bit of sweet potato from the bowl or jar, or to gently wipe applesauce from baby's face. The shallow spoon prevents feeding baby too much food at once. A contoured handle is comfortable to hold and angled for easy feeding. BPA, PVC, and phthalate free.